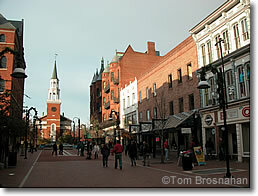 Burlington has Vermont's largest and busiest airport, an Amtrak train station at neighboring Essex Junction, and bus connections to Boston MA, Hartford CT, Montréal QC and New York City as well as to most Vermont towns. Interstate 89, US Routes 2 and 7 connection Burlington to the rest of the country. From Boston, follow Interstate 93 north toward Manchester and Concord NH, then I-89 to White River Junction and Montpelier VT, then to Burlington. I-89 continues north to the Canadian frontier east of Missisquoi Bay. From Montréal, take Route 15 south to the US frontier, continuing south on Interstate 87 to US Route 11 east via Rouses Point to US Route 2 south to Burlington. Burlington's bus terminal (tel 802-864-6811) is at Burlington International Airport, 1200 Airport Drive No. 1 (map). Greyhound Lines and Vermont Translines, which replaced Vermont Transit, operates all these services except for the Bennington—Albany shuttle, which is a service of Yankee Trails. Essex Junction Station, 7.4 miles (12 km) east of Burlington's Church Street Marketplace in Essex Junction VT (map), is the nearest stop to Burlington for Amtrak trains. When you make your train reservations and/or buy your ticket, remember that your destination is Essex Junction, Vermont, not Burlington. Amtrak train schedules do not list Burlington as a station stop, only Essex Junction.